Taylor Swift is in LA! Taylor Swift’s reputation stadium tour has finally reached Los Angeles. On May 18th and 19th, she will be performing at the Rose Bowl in Pasadena. Like most concerts, hers will feature special guests, but, in the typical Taylor Swift fashion, these special guests are strong women artists. 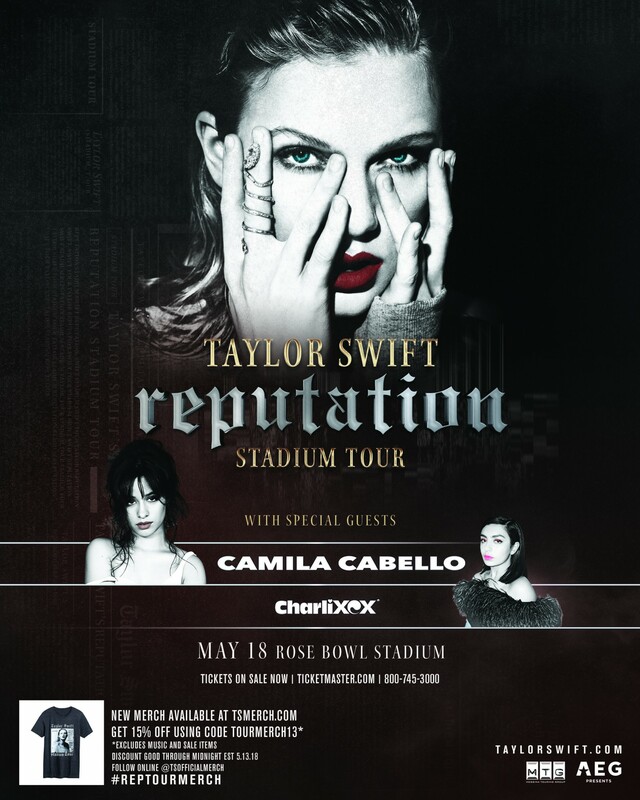 Camila Cabello and Charli XCX will be joining Swift on both of her concert days in Pasadena, and they’re sure to be pretty epic shows. Tickets are still available on several ticket websites, including Swift’s own website; they range from $45 to $180 depending on the seat location. Official merchandise is also being sold online for those who do go to the concert but can’t stand the lines or those who can’t go and just love Taylor Swift. Taylor Swift will be at Pasadena in two and a half weeks, where will you be?